There is an Advert on the US Dashboard (Non-Beta) for the movie Chasing Mavericks, starring Gerard Butler, Coming out October 26th. 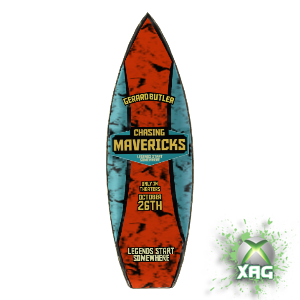 If you click on it and go to Downloads you can get yourself this Chasing Mavericks Surfboard! Its a pretty nice Avatar Prop. Thanks to our XAG Fan David H. for pointing this one out!